It’s no secret that the field of IT field is booming. Whether it’s for business or pleasure, more and more of our daily activities are moving online, increasing the need for skilled IT professionals to help build, improve and protect the systems and networks we all use. However, IT professionals aren’t the only group who could benefit from having a strong understanding of the world of IT. Software salespeople need to understand their products; teachers need to familiarize themselves with emerging technology, and marketers will undoubtedly work with technology in many capacities throughout their career. The list goes on and on! No matter what your specialty is, there’s a real benefit to developing a good understanding of this growing discipline. 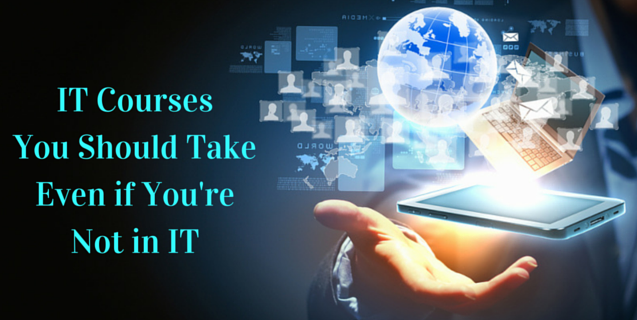 Here are some courses to consider even if you’re not in the IT field. The business analyst has emerged as an important role in information technology projects, responsible for bridging the gap between IT and the key business participants of any project. If you’re a business professional or project manager hoping to remain relevant as IT’s importance grows, this course could be for you. It focuses on the many types of modeling techniques that are used by the business analyst in system development and provide hands-on experience for attendees to learn how to develop and interpret the models. It’s never a bad idea to have a baseline understanding of web fundamentals such as HTML or CSS. Why? It’s the new language of many businesses, so being able to “talk the talk,” even if you don’t specialize in IT, can improve your ability to communicate with IT professionals, and allow you to understand and quickly assess potential challenges. If your company – or the industry you are hoping to break into – exists in any way in the cloud, a solid understanding of networking fundamentals could favor you. Or, perhaps you are considering a transition into IT but aren’t sure you want to take the leap. A course in network fundamentals is a good place to start. Courses such as these at ONLC teach and validate fundamental technology concepts. You’ll learn the basics of local area networking, defining networks with the OSI Model and understanding wired and wireless networks. Plus, you’ll gain an understanding of Internet Protocol, implementing TCP/IP and working with networking services. Many businesses today rely on a secure and safe network within which to store critical information, including buyer and prospective buyer information. That requires a heavy emphasis on quality security. If the business you hope to excel in relies upon the latest in systems security, having a thorough understanding of such applications could benefit you. In our Security Fundamentals program, we teach and validate fundamental technology concepts. Vital fundamentals of security are included, such as understanding security layers, authentication, authorization, and accounting. You’ll also get comfortable with security policies, network security, and protecting the server and client. When it comes to IT, most members of the workforce are given two choices: get on board, or get left behind. These courses that ONLC offers will give you a solid background in IT, and that can benefit you in a wide range of disciplines across the board.